It is second plays third when the Ospreys entertain Connacht at the Liberty Stadium on Friday evening in the pick of the Round Five RaboDirect PRO12 clashes. The Ospreys are currently undefeated in the 2011-12 season while Connacht fell to Edinburgh in Round Three in their sole defeat thus far. Despite having played on Sunday, coach Sean Holley has made just one change to the starting line-up with Ian Evans coming into the second-row in place of James Goode. Dan Biggar takes the reins at fly-half once again having slotted 20 points in their Round Four win over Ulster. Connacht, meanwhile, have kept the same backline which defeated the Dragons but have decided to alter their personnel in the pack. Dylan Rogers replaces Rodney Ah You at tight-head while Michael Swift starts in the second-row. TJ Anderson makes his first competitive start for the Province at blindside. Elsewhere on Friday evening league leaders Munster travel to Murrayfield to face Edinburgh. Along with the Ospreys, Munster are the only undefeated side in the PRO12 and will look to keep their run going against the ninth placed side. With this in mind, Munster boss Tony McGahon has opted to make wholesale changes with ten new faces coming into the XV. One notable omission is Doug Howlett who is given a well deserved rest after his substantial involvement in both pre-season and their PRO12 campaign to date. Former Ireland internationals Peter Stringer and John Hayes are both rewarded with a start. Edinburgh boss Michael Bradley has made three changes with Matt Scott, Lewis Niven and Grant Gilchrist all starting. In Friday's other clash - the Newport Gwent-Dragons host fourth placed Ulster in a week where they have announced the signing of South African speedster Tonderai Chavhanga. And the Springbok has been thrust straight into the reckoning after being named on the wing while Bedwas tight-head Kieron Jenkins will hope to make his first start for the region from the bench. And Dragons coach Darren Edwards is relishing the chance to see the winger running out at Rodney Parade. "It's been great to finally have Tondi in our ranks," Edwards said. "It's been a long process to get him here but the buzz he has created in the team is really encouraging. Not only does he have a speed that is well-documented but he has a great understanding of the game which will stand him in good stead. "He is also very hard-working and has fitted into the team really well. 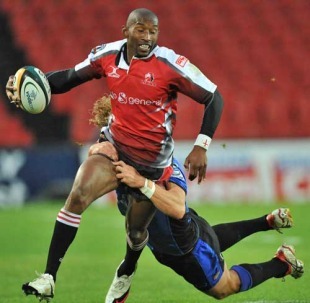 Our dressing room cohesion is a vital part of rugby at the Dragons and Chavhanga will certainly add to that." On Saturday, Treviso will look to continue their winning form after dispatching Glasgow last weekend against the Scarlets while Leinster host basement club Aironi. Cardiff complete the weekend's action against Glasgow.